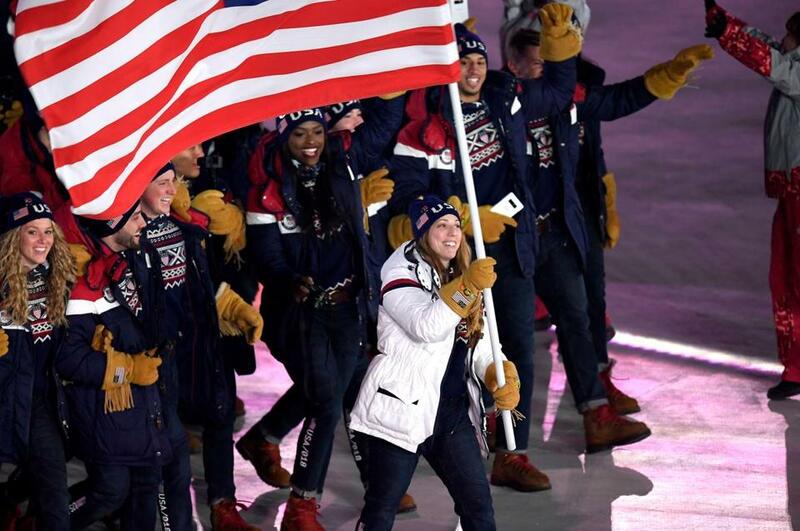 Luger Erin Hamlin led Team USA into Olympic Stadium during the Opening Ceremony. PYEONGCHANG, South Korea — The Olympic torch was finally lit, its flames licking the cold South Korea sky, a fitting and beautiful end to one of the greatest nights of pageantry the sports world has to offer. It was former gold medal-winning figure skater Yuna Kim who set these Games alight Friday, not only igniting the tower that will burn for the duration of the 17-day Olympiad but setting off one final round of pyrotechnic wonder, fireworks raining overhead as well as exploding inside PyeongChang Stadium. Yet as much as the frigid evening closed amid the sounds of celebration, the overall vibe was heavier on emotion than on gimmicks, hinged upon the unexpected display of unity between the host nation and its estranged neighbor. To a backdrop performance titled “Peace in Motion,” the South Korean and North Korean Olympic teams entered the Winter Games together under one flag, ultimately sitting alongside each other in the stands. They were a living reminder of the ideals of the Olympic Games themselves, spurring speeches calling for fairness on the playing fields and unity taking over where politics has reigned, at least temporarily. Through an entryway and onto the circular stage, all the Olympic athletes came, some marching, some dancing, some waving, some crying, nation after nation carrying its flag into a stadium filled with dignitaries and local fans alike. From the throbbing expanse of athletes clad in United States red, white, and blue to the tiniest nations on the globe wearing their own colors (and an unforgettable encore appearance by bare-chested Toga flagbearer Pita Taufatofua), the heartbeat of the Olympic Games truly started thrumming, not simply found at an official opening, but in the chests of the thousands of competitors who have descended upon this frigid mountainous corner of South Korea. It was through that tunnel that Erin Hamlin emerged, her white Ralph Lauren jacket shining bright against the blue ones on the rest of her American teammates, her wide-open eyes and expansive smile beaming brightest of all. The 31-year-old four-time Olympic luger knew she would be battling nerves like nothing she’d felt at previous Opening Ceremonies, nerves that had nothing to do with her upcoming intent to hurtle herself down the track again. 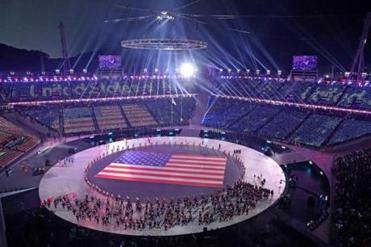 For her, it was all about entering the Olympic Stadium with her flag. The Winter Olympics open Friday in PyeongChang with a gala ceremony meant to showcase South Korea’s rise from poverty and war into one of Asia’s most modern nations. There she was, waving the stars and stripes with pride and joy, leading a rollicking US contingent on its turn around the stadium floor. “I slide. That’s what I do. Put me at the top of a track; that’s my happy place,” Hamlin said earlier in the week. “Walking out in front of a lot of people and even more people watching from home, having to not trip over my own feet or drop the flag is going to be way more nerve-racking. It will be. Needless to say, Hamlin did just fine, the pole safely in the grip of her enormous, fringed brown suede gloves, the perfect complement to the heated jacket ensemble all the American athletes wore. Yet even as the pageantry continued, as pockets of fans erupted in applause for their home nations, as South Korea unveiled its amazing show of unity, in many ways the true beauty of an event like this is in that heartbeat, in that core. The people. The individuals. Those who make up the amazing mosaic that is the Olympic Games, allowing us to marvel at the way so many small human stories can be wrapped in this giant international package. Like the story of Hamlin, whose unexpected turn on the medal stand four years ago in Sochi, making her the first individual American ever to medal in luge, brought a new level of respect and attention to her chosen sport. That she was voted into the enviable flag bearer position brought out expected emotions, largely because of the inherent implication about what she has accomplished. It’s more than just the hardware. “Winning a medal is the effort you put in and the time and the work and sacrifice to succeed and achieve something,” Hamlin said. “That’s all on me. That’s something I’ve done and worked hard for, and you accomplished that goal. One of those fellow deserving athletes made his displeasure known through Twitter. Veteran speedskater Shani Davis split the eight votes cast by a USOC panel with Hamlin but lost a coin flip for the honor of carrying the flag. He is entitled to his disappointment but was wrong to cast a shadow over Hamlin, whose Olympic record is exemplary. Her performance was, too, on a night that for these first-time Olympic eyes was simply extraordinary. From a preshow performance by a combined taekwondo team to the gorgeous dance sequences telling the story of a journey to peace, from opening drumbeats to a final quartet singing John Lennon’s epic ode to peace, “Imagine,” it was indeed a night to remember — to wish, as Lennon did, for the world to live as one.